“In the beginning…. there was THUMP. 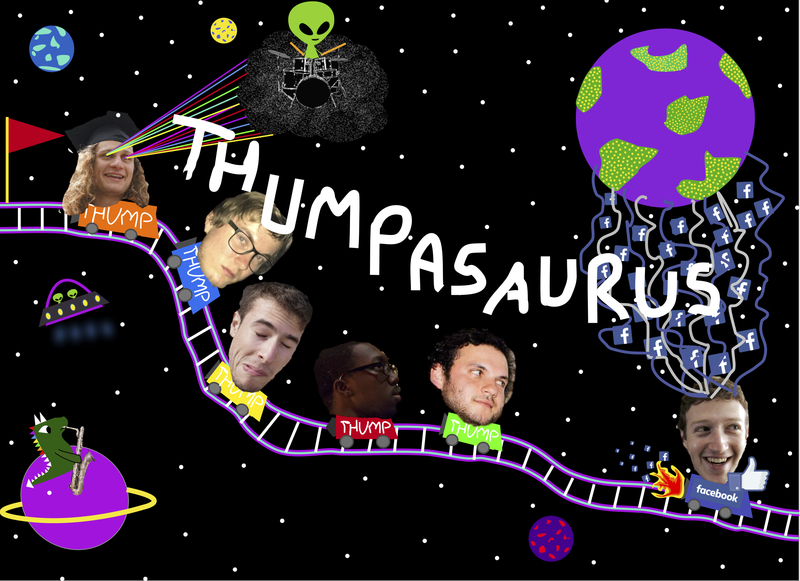 And, there was Thumpasaurus. Coming together at the University of Southern California’s Thornton School of Music, the founding members of Thumpasaurus have developed an eclectic, homemade aesthetic unlike anything else this side of the Milky Way. With a homebase at USC’s famed underground performance venue YONI and Silverlake mecca Tenants of The Trees where they’ve opened for cult acts like KNOWER and Vulfpeck, Thump has honed their ability to get people dancing, grooving and laughing. Their analog, classic rhythm-section setup recalls 70s funk acts, but the vibes they bring are pure 2016, influenced by LA’s up-all-night electronic music scene. The band also showcases their unique creative personalities through their emphasis on multimedia live show experimentation and performance art, drawing influences that range from “clowning” to the hero’s journey.